서울은 하수에 의한 공공수역의 수질오염문제가 대두되면서 1976년 시설용량 15만톤/일의 청계하수처리장 건설을 시작으로 1988년 부터 본격적인 하수처리를 하게 되었다. 2002년 현재 중랑, 탄천, 서남, 난지 4개의 하수처리장에서 1일 611만톤의 처리용량을 갖추고 하수처리구역내에 발생하는 하수의 전량과 분뇨를 처리하고 있으며, 하수도 보급율 98.7%로서 서울시민 대부분이 하수도 혜택을 받고 있다. 그러나 하수의 누수에 의한 토양 및 지하수 오염과 하수관거에 지하수가 유입되면서 하수처리 효율저하 문제 등이 발생하여 현재 불량하수관을 개선하기 위한 하수관거정비사업을 추진 중에 있다. 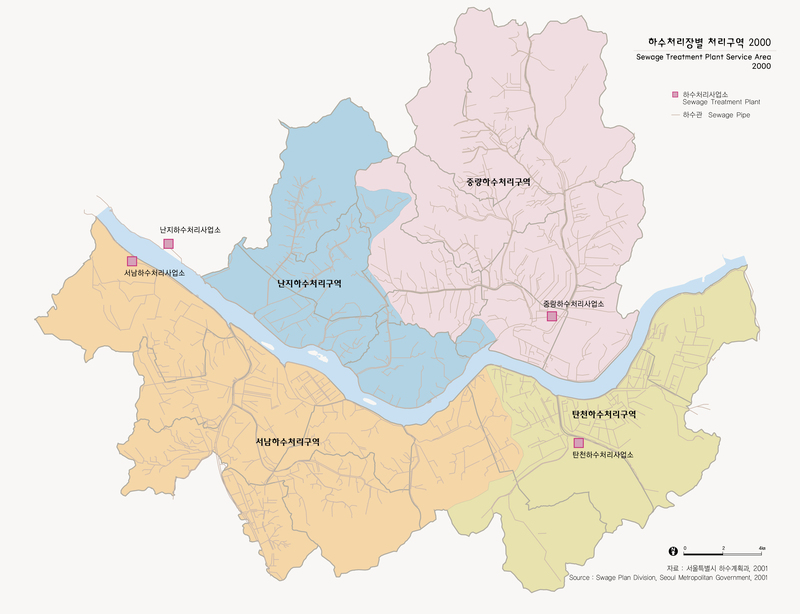 As water pollution became a serious issue in Seoul, Seoul began building the Chonggye Sewage Disposal Plant with the treatment capacity of 150,000 tons of sewage/day in 1976. The plant was completed in 1988 and went into full operation. As of 2002, Seoul has 4 sewage treatment plants (Jungnang-chon, Tanchon, Seanam, and Nanji) with the treatment capacity of 6.11 milion tons of sewage and excretion/day. 98.7% of Seoul residents have access to sewage systems. Over the years, problems with soil and underground water pollution due to sewage leakage and the infiltration of underground water into sewage systems caused inefficiency in sewage treatments, and Seoul is pushing ahead with a project for new sewer pipe changes.